Residents are being invited to have their say on how council chiefs should cut £56m from their budget. North Tyneside Council is preparing to go out into communities to ask what the priorities should be in the authority’s budget. Following the government’s budget earlier this year, the council now has to achieve spending cuts of between £53m to £56m over the next three years – on top of £43m it has saved in the last two years. The council is keen that residents have their say in the early phase of budget planning, and have arranged four drop-in events over the coming month. • Wednesday, October 14, at Oxford Centre, Longbenton. All the events take place from 2pm to 4pm and 6pm to 8pm. Residents are asked to book a place by e-mailing engagement@northtyneside.gov.uk or calling the council’s engagement team on (0191) 643 2828. Anyone unable to attend the events will have an opportunity to give their feedback. Mayor Norma Redfearn said: “The choices that we will have to take are going to be really tough and therefore it is vital that from the very start of this process that we listen to our residents to find out what is really important to them and where they think spending should be prioritised. “Throughout the budget setting process we will be looking at every possible way to reduce costs as well as challenging all spending and finding more efficient ways of working to lessen the impact of these severe government cuts. 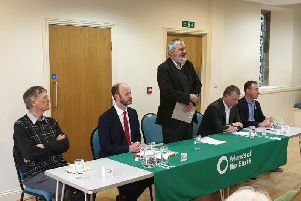 She added: “The challenges we are facing are very similar to those being faced by households across the borough every day – except on a much larger scale. “There are some things that the law says we have to do; however we have to think about the range of different options we have, and be open to all options in our decision making. “These are very important issues and I would urge everyone to have their say and find out more about the £53m to £56m that we now have to save – on top of the £43m we’ve already delivered over the past two years. Overall the engagement process runs from September until January 2016.